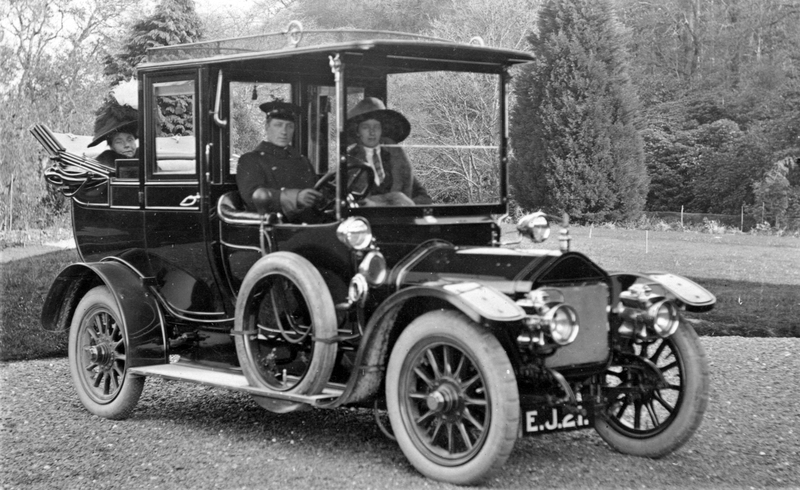 Motor Vehicle Registrations started in Cardiganshire on 1st January 1904 and it took 45 years till 1949 for 10,000 vehicles (EJ 1 to EJ 9999) to be registered in the county. Following on from my previous blog of October 2014, I have now completed transcribing these motor vehicle registration records, all records now on a fully searchable database which can be found on the Ceredigion Archives website. This blog is a brief summary of these records. To make sorting this large amount of information easier I’ve divided these records into three groups: Group 1, Cars, Vans & Lorries (totalled together); Group 2, Motorcycles; and Group 3, Tractors. A simple chart showing the distribution of the 10,000 vehicles registered in these three groups and across all the years can be seen below. We can see from the chart that the numbers on Cars, Vans & Lorries increased slowly until 1915. The effect of World War 1 (1914-18) wasn’t reflected in the number of vehicles registered in Cardiganshire until 1916 when there was a small decrease; this decrease continued for the next two years with only a small number registered in the years 1917-18. After WW1 the number of vehicles in this group increased gradually until a peak of 450 a year in the late 1930s. During World War 2 between the years 1939-45 there were again only a few Cars, Vans and Lorries registered while at the same time there was an increase in the number of Tractors, most of which were registered for the War Department. This increase in Tractor numbers to over 350 a year continued after WW2. The number of Motorcycles registered followed the same pattern as the cars during the early years, reaching a peak in the mid 1920s. From this peak their numbers decreased year on year through the 1930s and 1940s with only a handful registered during WW2. Using information from the database, we can determine the motor manufacturers with the most vehicles registered for the first group (Cars, Vans & Lorries) during the years 1904-1947, which can be seen in the chart below. During these years there was a total of 125 different manufacturers represented in this group, of which 45 manufacturers were only represented once. From the chart (which shows only the top ten manufacturers), we can see that Austin was the biggest manufacturer for this group with 1548 vehicles, followed by Ford (1073) and Morris (965). The total of these three vehicle manufacturers is greater than the total of all the other 122 manufacturers together. It is interesting to look at the yearly distribution of these three top manufacturers, seen below in a simple graph. 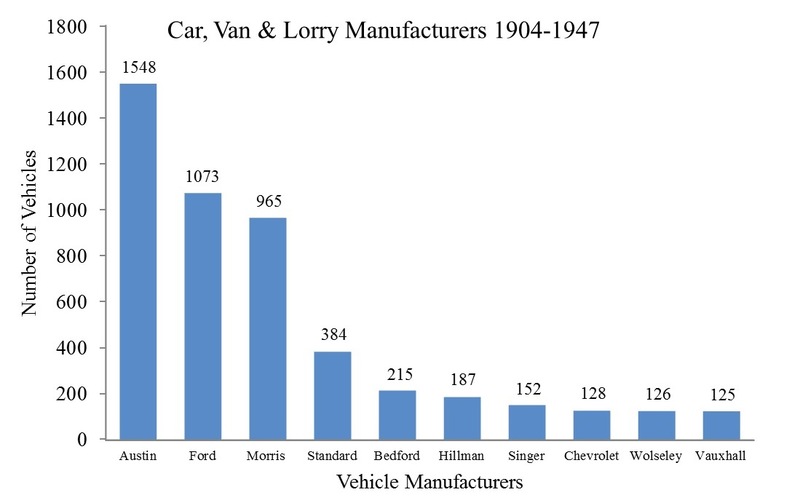 From the graph we can see that Ford was the most popular manufacturer after World War 1, its Model T reaching a peak in the early 1920s with over 120 vehicles registered. 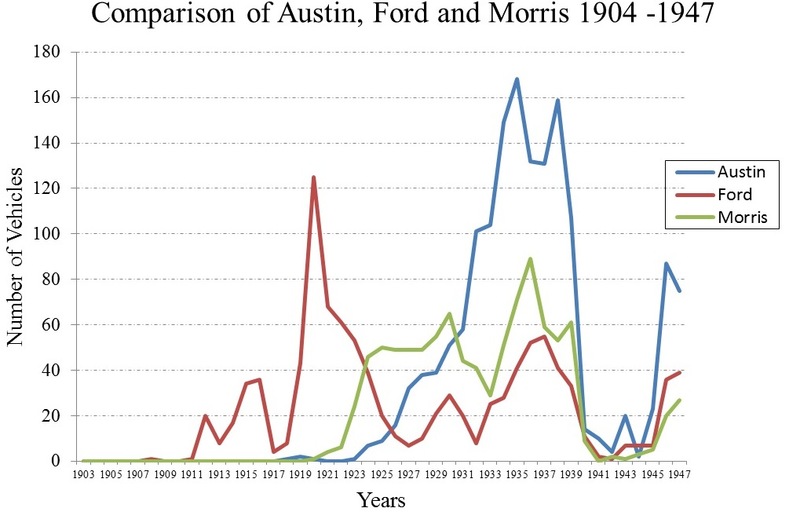 Morris was the most popular in the mid 1920s followed by Austin. The Austin, however, had the most popular models during the years 1934-37 with more than 160 vehicles registered, which was more than the total of the other two manufacturers. 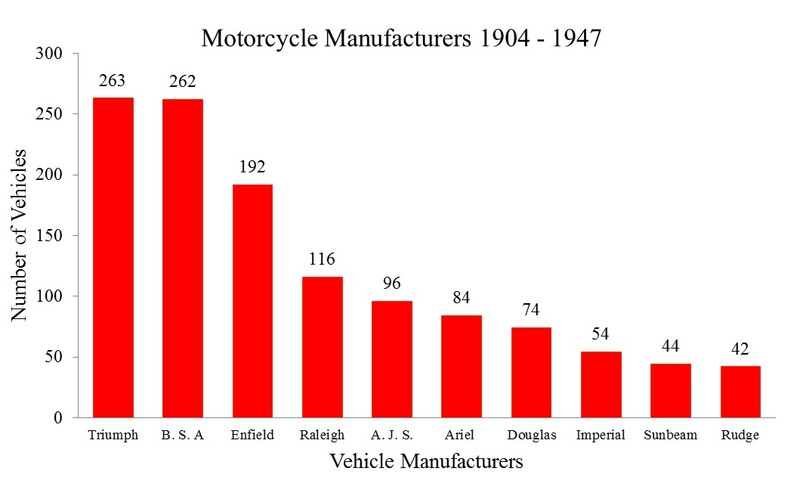 Again using information from the database we can determine the manufacturers with the most vehicles registered for the second group (Motorcycles) during the years 1904-1947 which can be seen in the chart below. During these years, there were 114 different manufacturers represented in this group, of which 40 manufacturers were only represented once. From the chart (again, only showing the top ten vehicles) we can see that Triumph was the biggest manufacturer with 263 machines followed closely by BSA (262) and Enfield (192). The total of these three manufacturers is greater than the 111 other manufacturers put together. 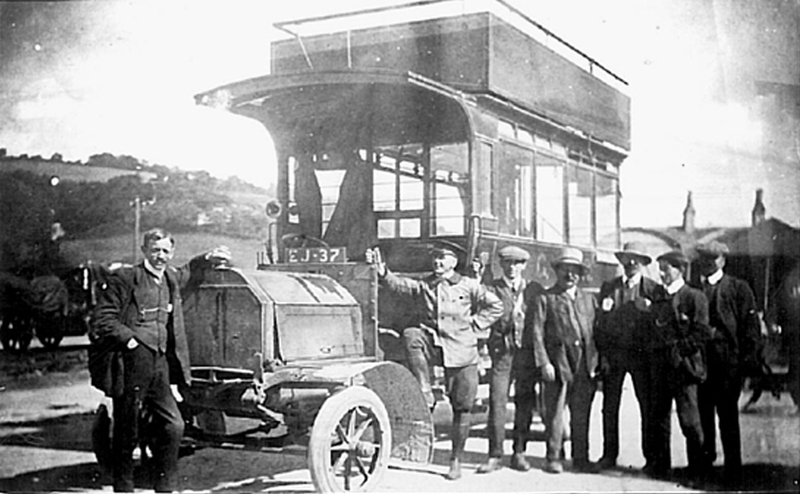 I’m now in the process of writing a more comprehensive report of all the vehicles registered in Cardiganshire during the years 1904-1947. These will include a more detailed account of both the most popular and least popular vehicles registered in the county together with the weird and wonderful vehicles, some of which were only registered once. An example is the Murphy Invalid carriage seen below, a recent garage find first registered in Cardiganshire on 7 July 1939. This entry was posted in Guest blog, Motor vehicle registration and tagged guest blog, number plates, vehicle registration. Bookmark the permalink. Really enjoyed the post. I wondered if the driver in the photo was my great grandfather who worked for the Parry’s as a chauffer at that time. I sent along a photo to the archives of him driving one of their cars. If it is him, it’s awesome tp see him in his uniform. Thank you! We are very happy to see how popular the vehicle registrations blog and database have turned out to be. We hope to work out a way of displaying photos with the vehicle records soon.